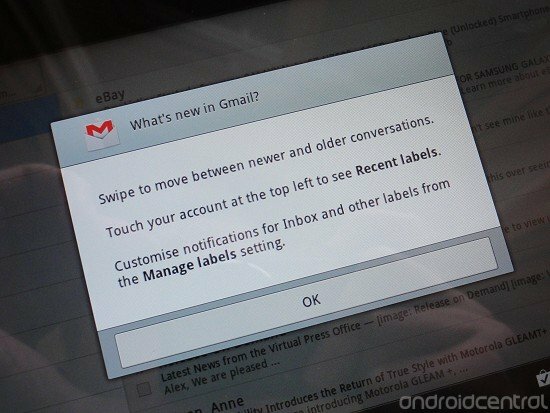 Google has updated the official Gmail app for Android today, with assorted changes for Android phones and tablets running Froyo, Gingerbread and Honeycomb. The most significant changes are for Android 3.2 tablets -- Honeycomb now gets access to a few handy features which until now have been reserved for ICS. These include swiping between messages, and a shortcut in the top left corner for selecting recent labels. Honeycombers also the ability to customize the way Gmail notifies you about mail with different labels. Google hasn't forgotten that the majority of Android phones are still on Gingerbread or Froyo, however, and for them, this update will deliver performance improvements and a new labels API for third-party app developers. Hit that Google Play Store link and head to "My Apps" to grab your update.